Tell us about yourself and your journey with Zabbix? I started working in IT in 2012 when I met the CEO of a Brazilian IT company and he invited me to join his team. My first task was to provide support for open-sources software, firewalls, networking and routing. In a short while I found out about Zabbix and I quickly got interested. I then started to study the platform and participate in the Zabbix community. In 2014 I left my first job and joined to Unirede Team, assuming a new position where I learned about new monitoring technologies and systems integrations with Zabbix. By that time I was also making some speeches about open sources technologies around Brazil and in 2015 I gave a talk about Zabbix and Telegram integration at Zabbix Conference Latam, which in turn inspired other companies to do the same. This experience helped me to form a solid base for my “new career opportunity” in Saque e Pague, developing new ways of monitoring ATM’s and financial solutions. Why did you pick Zabbix to be your monitoring solution of choice? I’ve been working with Zabbix since 2013, and when I became a part of Saque e Pague team, I was tasked with changing the monitoring structure of the ATM and data center environment. Saque e Pague had other two monitoring tools in use for ATM monitoring, and Zabbix for data centers, my first thought at this moment was: “Why not simply use one monitoring solution for all our environments?” We decided to do a POC with Zabbix to monitoring our ATMs, it was successful and Saque e Pague decided to move everything to this one tool. Zabbix is the best platform to perform the integrations and automation we need because it has one of the best API I’ve ever seen, and in a few steps, using python, php and other programming languages, we could integrate Zabbix with or ticket solution. In addition to that, we could also execute remote commands to recover our ATM’s, which has been very fast, saving a lot of money. Could you please share some insight about your speech at Zabbix Conference LatAm 2019? How exactly is Zabbix related to the transformation of financial flows in Brazil? Saque e Pague is a technology company, it has a “multi-solutions ATM” network that transforms the financial flow in Brazil. With this ATM people can pay, deposit, withdraw and transfer cash money. Currently, Saque e Pague has almost 1300 ATMs in 18 Brazilian states and R$39bi worth of transactions in its network. Using Zabbix we guarantee the availability of each one of these ATMs and monitor about 170 sensors inside our solution. We can execute remote commands to fix any issues immediately, saving time and money, and improving the availability of our solutions. Currently, Saque e Pague has about 250k items, 1400nvps and 6 proxies for distributed monitoring. Our SLA is calculated in Zabbix IT Services, though with our 70k items on the service tree we needed to customize the front-end to be able to access all this data, and export a detailed report with the SLA average percent. We created an internal process for making new hosts in Zabbix, that executes a python script to populate the SLA tree based on tags in triggers and feeds the parent item. We also have a similar process to remove the host and all its dependencies on Services tree. To adapt the ATM maintenance schedule, we developed an extension that puts the host in maintenance mode based on a specific trigger for a scheduled period. 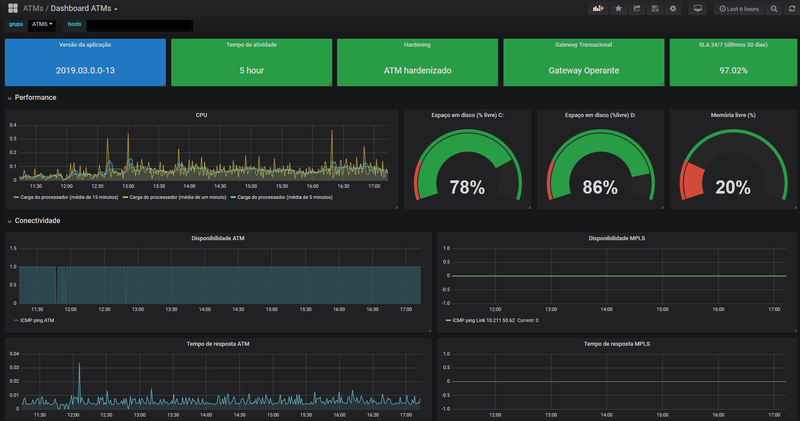 In addition to that, we integrated Zabbix with Grafana to generate some dashboards to each ATM using the templating resource, making them easier to visualize and manage. We made other dashboards to represent our transactional volume, which is collected directly from our database using Zabbix odbc connector. This made troubleshooting of anomalies in the environment faster, increasing the availability of our whole transactional networking. What were the challenges with implementing Zabbix and what kind of solutions have you found? More importantly, what was the result? Our first challenge was “How to deploy and keep the Zabbix Agents updated on our 1300 ATMs around Brazil?”. We opted to use a national platform called Trauma Zer0 by iVirtua, which we used to deploy our applications on ATMs. We also developed a Zabbix Installer in Python that analyses the version of each one of the scripts for ATM monitoring. Our second big challenge was creating and processing the service feed, mapping all triggers associated with ATMs and displaying this information in a simple way. The solution was to create a script that would be able to detect and register a trigger in Service tree. In order to achieve that, we configured a tag in all triggers that indicate unavailability, based on which we made a script to make this job easier. In the beginning, we thought it would be possible to see all this in Zabbix front-end, but we couldn’t see the necessary data. That part of front-end became slow, considering the size of our service tree. The solution was to find different means to access the data. The result is a stable monitoring solution that provides all the necessary information about our environment, which offers easier ways to automate and is highly scalable. Saque e Pague is a fast-growing company and Zabbix helps us predict and scale our network, automate our internal process, simplify troubleshooting saving time and money. Zabbix was our best choice! Next Next post: Zabbix 4.2 out now!